Exploring a floating village on Tonle Sap Lake by boat. The floating villages at Tonle Sap Lake have become something of an interest for tourists visiting Siem Reap. 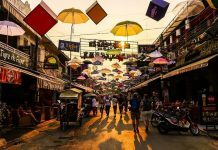 The fascination with people who live in floating houses, travel to floating schools and eat at floating restaurants is quite an attraction for the many visitors that come to Cambodia. As well as the floating villages, there are also stilted villages along the banks of Tonle Sap Lake, where houses and buildings rest on tall, thin stilts that keep the occupants dry during the wet season, with giant ladders to reach the lower levels during the dry season. 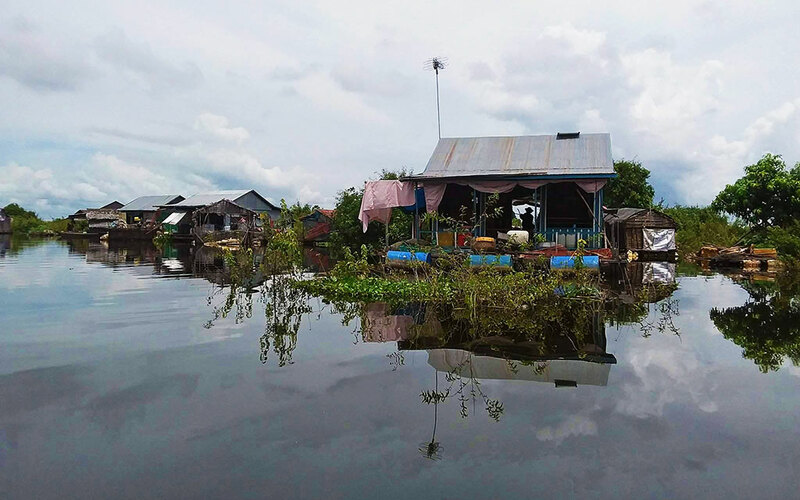 Several communities of people are living on the Tonle Sap Lake. 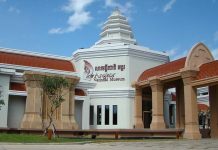 There are four main villages that are accessible from Siem Reap and a variety of ways to get there. 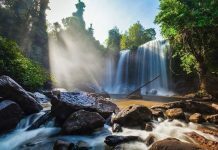 The villages: Chong Kneas, Mechrey, Kampong Phluk and Kampong Khleang are described in detail below. 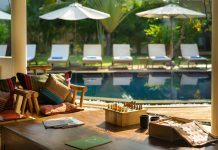 Chong Kneas is the closest village to access from Siem Reap, approx. 16 km. Consisting of stilted houses and also floating houses, which are regularly moved around according to water levels. Chong Kneas is also the boat terminal for Battambang and Phnom Penh. Chong Kneas is largely set up to serve Korean tourists, as such there are numerous Korean restaurants. It is also a common place for rice scams. The boat tours are not owned by the local community and the people living here see hardly any of the vast amounts of tourist money coming in. 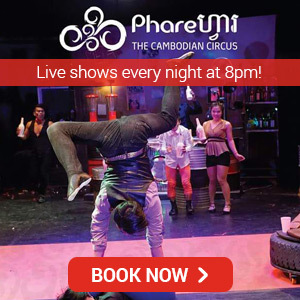 In short, unless you’re planning to travel by boat to Battambang or Phnom Penh, there’s probably not much else here of interest. Kampong Phluk, which literally means “harbour of the tusks”, is actually 3 villages, with mainly stilted houses, that line the main entrance to the Tonle Sap Lake from this area. 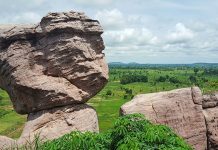 It’s just over 30km from Siem Reap and can be easily managed in a half day trip. The community sustain themselves mainly on catching fish and shrimp, but also harvest some land crops during the dry season. The road trip and also the river trip are relatively short compared to some of the other villages. A private company will ferry you through the village to the lake as that is the main destination. 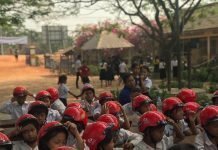 There aren’t any activities that tourists normally can do in Kampong Phluk as this is a working village and most of the people are focused on their own industry, quite separate to the tourism industry buzzing past their doors. Literally going right past the houses of the locals can be interesting to view another way of life, but it can feel quite invasive as well, especially knowing these residents aren’t either involved in or receiving any benefit from the industry. However, nearby there are small boats that can take you around the mangroves, or flooded forest, which is a more authentic experience. There are also a few floating restaurants and stopping here also supports some of the local tourism industry. 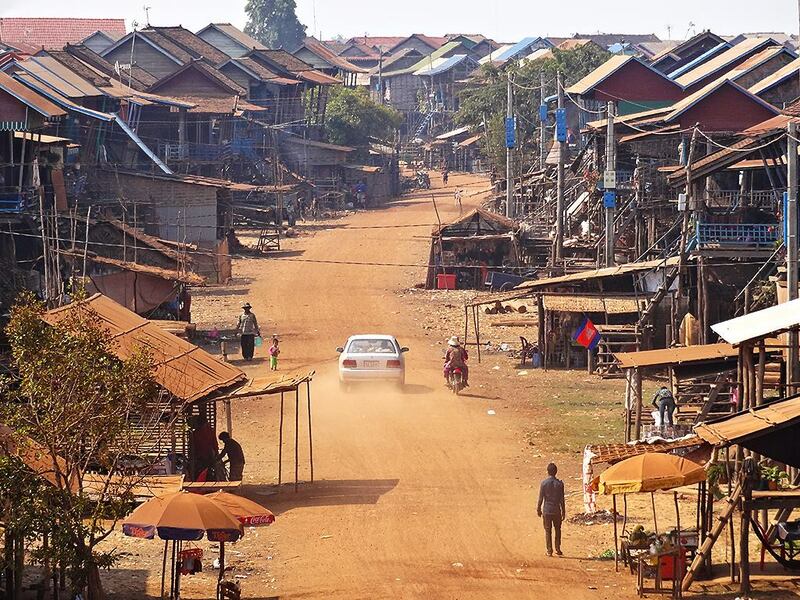 Kampong Khleang is a permanent stilted village along the banks of Tonle Sap. 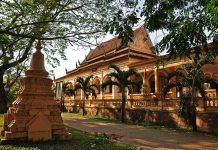 Kampong Khleang, literally meaning “harbour warehouse”, is a permanent stilted village around 50km southeast of Siem Reap. This village is the furthest away from Siem Reap of the villages often visited on the Tonle Sap Lake. 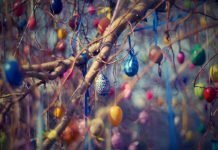 As such, it doesn’t have the same volume of tourists visiting, which can be appealing if you want a more genuine experience and a more relaxed pace. Kampong Khleang has both stilted and floating houses, as well as many other buildings to sustain this large community of approximately 6,000 people. 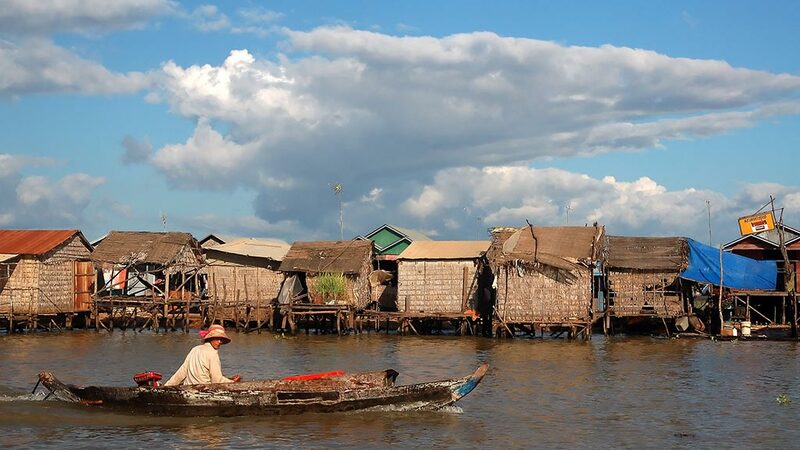 The floating houses are moved according to the water levels of the Tonle Sap Lake. During the dry season, the houses are more or less on the lake’s edge. The boat service here is owned and run by locals, meaning your money is supporting the local community. Beyond Unique Escapes and Triple A Adventures both run tours to Kampong Khleang. The Beyond Unique Escapes tour includes visiting the local market and a sticky rice producing village. 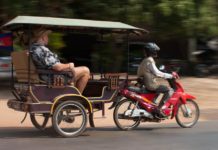 It’s also possible to make your own way there by tuk tuk and hiring a boat once you arrive, giving you more flexibility with timing. Mechrey floating village still offers a ‘real life’ experience. Mechrey floating village is located 25km southwest of Siem Reap and approximately half way to Prek Toal; also a floating village and the entry point into the Prek Toal Core Bird Reserve. Mechrey’s community lives from fishing, and more recently, the development of eco-tours. As a newcomer to the tourism market, things are pretty grassroots level. However, many of the methods applied in other villages are evident in Mechrey – such as offering tourists the opportunity to buy rice for local orphans. 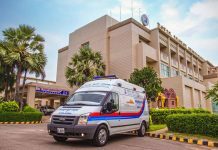 Whilst this may seem like a kind and generous thing to do while travelling, it’s often causing more harm that help – think twice before donating in this way, it can be much more beneficial to donate money to a reputable organisation, like The Lake Clinic who provide medical support to communities on the Tonle Sap Lake. It’s often said that the journey is prettier than the destination when it comes to Mechrey, however if the experience you seek is ‘real life’ then this is it. 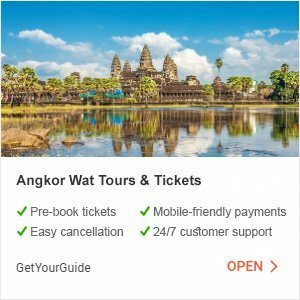 Your hotel or guesthouse can help you organize a private tuk tuk, alternatively try local tour companies like Hidden Cambodia Adventure Tours, Prek Toal Tour & Travel or Travel Loops. Research thoroughly before you go, there are a few pitfalls in visiting the villages on the Tonle Sap Lake. 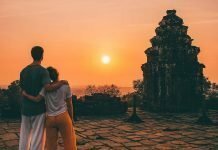 First of all, go with a reputable tour company such as Beyond Unique Escapes, Tara Boat, Sam Veasna Center or Triple A Adventures. These organisations run tours that will give you the best experience of the lake whilst being considerate of the people living there. Beyond Unique Escapes as well as Triple A Adventures only run tours to Kampong Khleang, their choice for a responsible floating village visit. Tara Boat do trips to Chong Kneas and Kampong Phluk, including a sunset dinner excursion. Their tours stick to a path that keeps interference of daily life on the lake to a minimum, only visiting established tourism sites. Tip: Book your Tara Riverboat cruise ahead to avoid disappointment, as this is one of the most popular excursions on Tonle Sap Lake! Sam Veasna Center tours go to Chong Kneas and the flooded forest, as well as Prek Toal Bird Sanctuary. 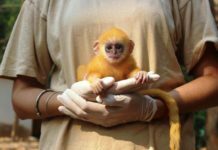 SVC provide educational tours and facilitate conservation of wildlife areas across Cambodia. Avoid visiting any schools, it is common for schools to plead for money to buy books or rice from tourists, however, the money is rarely used for what is claimed and may not benefit who or how you think. The best way to support communities in the Tonle Sap Lake region is to spend money at souvenir shops, restaurants or information centres. In the flooded forest, you can take a ride in a paddle boat and this is another source of local employment that benefits the community from tourism.